Why did the Cylon take a cruise? For the FOOD, of course. He had to use those cannons to cut the pineapple into smaller chunks, but he managed. Battlestar Galactica has been nominated for four Emmy awards. Surprisingly for a genre show, the nominations include nods in the directing and writing categories, as well as nominations for sound editing and visual effects. Considering the jaw-dropping sequence from “Exodus, Pt 2” when the Galactica slammed into the atmosphere on New Caprica, I think the chances are pretty good our favourite show will actually win something. I have always said that BSG is one of the best written shows on TV, period. However, in my opinion, entertainment groups with “Academy” in their titles don’t tend to be the most open-minded. I will be pleasantly surprised if Ronald D. Moore wins for writing “Occupation/Precipice” or if Felix Alcala wins for directing “Exodus, Pt 2” but I don’t think it is likely. But it must be satisfying to be so damn good they can’t ignore you. An advance scouting party on our northern frontier? An old threat newly risen out of the Arctic ice? On my recent cruise to Alaska, I managed to totally embarrass my entire family by insisting on carrying my two Cylon Mini Mates with me. At particularly inopportune moments I would pull one of them out of my pocket and insist on photographing them. On this day, I thought the beautiful Mendenhall Glacier near Juneau would be a perfect backdrop. I held up the Cylon while my husband dutifully photographed the scene and my teenage cousin tried to hide behind the nearest bush. But then, it happened. 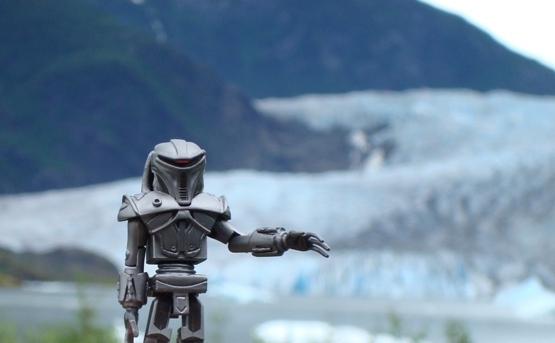 A guy walked by and said, “Cool, a Cylon at Mendenhall!” He smiled and continued forward to photograph the glacier. I have no idea who he was or where he was from, but he made my day. Battlestar Galactica fans are everywhere! You never know when or where you are going to meet one but carrying a Cylon with you does increase your chances. And that is totally cool! We’re at it again. The 13th Colony is planning the second of it’s Location Scouting Missions, to check out another cluster of locations used in the first Season of Battlestar Galactica. Our next stop? The campus of the University of British Columbia, which has doubled as the Rising Star in “Colonial Day” and Kobol in “Kobol’s Last Gleaming, Pt 2”. 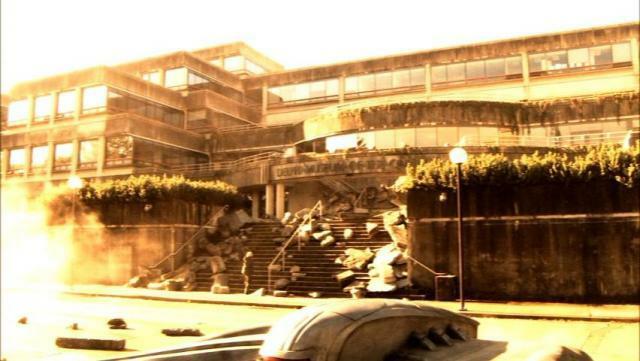 The picture above is of the Koerner Library at UBC, which is where Starbuck found a certain valuable arrow. We’re planning on a walking tour of the campus, followed by a picnic on the beach, on July 21st. Also coming up later in the summer is a tour of the Orpheum Theatre in Vancouver. The Orpheum was built in 1927 as a vaudeville theatre and has had a rich and varied history since then. It’s most recent claim to fame (and the one WE are so interested in) is that it has been featured prominently in the dreams of Laura Roslin and Gaius Baltar. The stage at the Orpheum is where the sequence of D’Anna finally seeing the faces of the Final Five Cylons was shot. This summer, the theatre is offering 90 minute public tours for $10, the proceeds of which go to the BC Entertainment Hall of Fame. Tours start at 11am on July 7th and 14th, and August 11th and 18th. Click here for more details. You are currently browsing the The 13th Colony blog archives for July, 2007.